This week on the GeriPal podcast, we talk with Angelo Volandes (click here to listen) (see transcript below). Angelo Volandes is famous for his use of video to improve advance care planning conversations with patients and their families. In this podcast we ask Angelo "why video?" We hear the story of how he got the idea for video in the first place. And we push him about the potential for bias in these videos. GeriPal review of Angelo's book "The Conversation"
Eric: Alex, we have another special guest with us today. Alex: We do! We have another special guest. We have Angelo Volandes who's coming here from Boston, from MGH (Massachusetts General Hospital). Angelo is a well-known researcher around the country. We got to know each other a little bit during your Bioethics fellowship and my Palliative Medicine fellowship, I guess. That seems like ancient history now. I guess, are we old enough to be able to say that? Angelo: Ancient history. We were taking Clinical Effectiveness classes together and enjoying statistics. Alex: That's right. Welcome. Thank you so much for coming and joining us today. Angelo: Thank you for having me. It's a real pleasure to be here. Alex: We usually start off with a song here. Eric: I think Angelo has picked one, is that right? Alex: Angelo has picked a song. A fine choice. Johnny Cash, Folsom Prison Blues. Alex plays "Folsom Prison Blues" by Johny Cash. All right. Well, welcome to San Francisco from the other side of the country. We are so happy to have you with us. We wanted to first get a sense from you about what you're doing. What you're known mostly for is video advanced care planning. I think the question that's on a lot of people's mind is why would you do this? How did you come to this idea? Why video when all of what's been done so far has been pen and paper and that stuff? Angelo: Yeah, that's a great question. Don't you want to play with a video camera instead of a stethoscope sometimes? I'm walking around the hospital having a film cam. Eric: That's why we had a bunch of microphones in my office right now. Angelo: This looks like my studio, my editing studio, here. Alex: We're moving in your direction. So far, we moved from web blogging to audio. Eric: Yes, and I guess the next step has to be video. Alex: The next step in our evolution would be video, but I don't think anybody wants to see us. Alex: They may want to see you, though, Angelo. Angelo: I even dressed up. I thought this was going to be video. I had my tie, my jacket, looking for a little audio and visual. No, but the idea of the video really came through residency. I was admitting patients, and a lot of times I was asking myself, "What are we doing to some of these patients?" Especially patients who had advanced illnesses and hadn't had conversations. One particular patient that I started having my conversations, she had an advanced illness. It was clear to me that when I was talking about goals of care, she didn't really have an understanding, and so I asked her, "Would you mind taking a tour with me around the hospital?" Of course, she agreed. We didn't walk. I put her in a wheelchair and I took her around the hospital to the ICU. She got to see a vent, a patient on vent, and as fate would have it, she actually witnessed a code. I brought her immediately out of the ICU, but she got to see what CPR looked like. When we went back to her room, we had a very different conversation. It was clear that the visual had helped her in a way that words clearly didn't. Obviously, we can't take people on tours, and that's really when I got the idea of using videos. Now I should also ... A little confession. During med school, I studied film. I took some time off to study film, so it was natural to meld the two. From there, I said to myself, "Why not take everybody on tours? Why not bring people to where it's at so that they get a better understanding as opposed to television where everybody survives CPR and everybody looks like George Clooney on a vent?" Eric: Just to summarize what I know about the studies that you've published is that it looks like adding video to advance care planning significantly influences how people make decisions. Generally, people are wanting less aggressive end-of-life care than if they didn't watch the videos. Is that a okay summary? Angelo: Yeah, I think the first word that you said is, "Adding video." A lot of times, people think this is to replace the doctor-patient relationship, and I'm like, "No, it's not to replace. It's to reinforce it." This is just an add-on. An enhancement. At the end of the day, what we want are conversations, not videos, but it just happens that videos catalyze the process. It gets people going. Our brains have been rewired where we want visual material. What we find is that people are more informed with a video, and when they're more informed and they have an advanced illness, they tend to make decisions more towards comfort care, which is what we know from all these surveys, that people don't want to suffer. They don't want to prolong the dying experience. They're more informed, and when they're more informed, they tend to make decisions towards more comfort-oriented care. Angelo: Amazon. Audio. Whatever you wish. iTunes, too. Alex: Your website which is? Angelo: The website is ACPDecisions.org. There's actually some free videos on that in both English, Spanish, and a bunch of patient checklists in like 20 different languages. Eric: We'll have links to all of those on the GeriPal website. Alex: Yes. Now I remember you had some examples of videos in your book, and I've seen some examples online and read many of your papers. Are there particular conditions for which video may be better suited or less well suited? Angelo: Yeah. The things that we see day in and day out that people don't see or that Hollywood doesn't see the way we see, Dementia. That's clearly a big one, the advanced stages. We talk to our patients and they think of Ronald Reagan, whereas we know in the advanced stages it's someone who can't walk, can't talk, and feed themselves. Those situations are really important to capture. Some that aren't or that are just a supplement are some of the Pal-Care conversation things that we focus on like values. To start that, videos are good, they help the doc or the nurse have a checklist of things to remind themselves to ask, but that could also be trained. You could train people to do that. When it comes to advanced illnesses, interventions is a key one. I was just over at one of the hospitals here in the Bay Area and we were filming Trach and Pegs. I think if I was a daughter in the ICU trying to figure that out for mom, that could be a tough one. To actually see and understand what life is like in an LTACH facility, I think those are important to be captured on video. Eric: How do you think about this question of bias, and when you are videoing something, how to make it both realistic ... I am guessing every video, you have a frame of reference, a potential bias, or an idea of what a good decision is. Your thoughts on that. Angelo: Two points. The bias and then the good decisions, or the right decision. Bias is hard. If you watch Fox News, Trump won, not only the electoral college but also the popular vote, whereas if you watch MSNBC we know the reality is he lost by 2 million votes. The visual medium is an aesthetic medium. You can change, edit, zoom in on a patient who is intubated and have that saliva drool and the breathing. Or you can do something that is more impartial. We spend a lot of time and we have come up with a series of criteria that people need to follow, certain angles, having a narrator, not using testimonials, even though we are narrative creatures, I could convince you if I wanted with the right patient telling me a story of how they survived CPR, even though statistics are that if you have an advanced illness, it is in the single digit percentages, so we are very careful about that. I make no qualms about it, the truth is that this is a biased medium. The best thing we can do is have lots of people review it. I always say that the end user has to view it and that is people who have had this illness or the families. Your other question, which I am forgetting, was "what is the right decision?" The right decision is what Alex tells me is the right decision. What is the right decision, it is what my patient wants when they are fully informed. What I hate is when I see my residents or my med students, the check box, did I ask the question. I am like, was it an informed discussion? The right question is when people understand their options. I happen to feel that video adds a lot of information, but at the end of the day the right option is what my patient wants based on their assessment of the risks and benefits. Also, as a doctor, I think that we have to make our recommendation and the most common question is what would you want if this was your mom? I invite those questions. Eric: It must be an absolutely fascinating reviewing process because I remember we did journal club. We have done, I think 10 of your articles on journal club, but one of them was a video of someone with advanced dementia and the big discussion was did she look enough like she had advanced dementia or did she look too much like she had advanced dementia? Angelo: It is a wonderful question. That particular video, I get so criticized for. Because let's face it, she looked really good. Angelo: I mean she had rouge, she had pearls. I put the make up on myself. She was being cared for and fed by her three loving daughters. That is not usual care, folks. Most people ... I actually, there are 21 Alzheimer centers around the country, probably more now, but when I made that particular video I asked them to send me what they had about advanced dementia. Only one place actually sent me something. It was a patient who was in her hospital bed, filled with feces, in a diaper, and half naked. I would argue that is probably more reflective of the reality. What our group said was lets show what the nicest version is and let's just see if there would be an effect with the nicest version. With that first study, when we saw that there was a tremendous effect in decision making, we said, could you imagine what it is really like if people actually saw it. I actually get criticized for this by a lot of docs. When I give a talk and they watch our CPR video, they are like, where is the blood, where is the gore. I tell people that this is not about gratuitous violence, it is more like a drug study. Start with the maximum dose, see if there is an effect. Here we are, showing the nicest possible situation, never show blood, and see what people think about or what do they think about the video? Is it palpable? How does it influence their decision, their knowledge, their anxiety, their depression? I say that if this is the best of both worlds and people still make decisions towards comfort care, could you imagine what the reality is like if they saw it for real? Alex: I have heard the criticism of some of these videos, not just yours, but others and this concern about bias. There is a little bit of unfairness to that, I think. Our language is often bias. I have heard docs say things to patients like, if you have CPR, I am going to have to crack your ribs, I may have to cut open your chest and massage your heart, which is ridiculous because that hardly ever happens. I have heard them say things like do not punctuate the end of your life with this senseless act of brutality. So there is certainly framing bias with the language we use, and yet the most common conversation out there is probably like, if your heart were to stop, do you want us to restart it? Or something horrific like that. There is, we have to recognize, our limitations to the language that we use and there is certainly propensity for bias there in many different directions. Video, what you are proposing to do is revolutionizing the way that we approach advanced care planning. Having standardized videos for whole populations. That is where it becomes critically important because as you do, we take a really thoughtful, measured approach, deciding on the videos, which we show to thousands and millions, potentially, of people. This idea of bias, I think that our language is far more biased, just like you said. I would actually have more comfort in a standardized video that has been vended by people that has been studies, over decades worth of research, so that even if you are a good doc having this conversation, or if you are a bad doc, at least the patient doesn't suffer and the family gets some information, in a standardized fashion. You're absolutely right. This is where Pal Care systems, information systems, thinking comes into play because now we are talking about can you take this to scale. That is where it gets interesting because you can train one doctor, one nurse, one provider at a time or you can try scaling video, which is cheap. It is cheap. Totally cheap. But you can start influencing on a larger scale, peoples information and how docs start behaving. One of the best things that I have noticed as a provider in my own hospital is now physicians, residents, med students, start emulating what they hear in the videos and seeing that in their records. That is behavioral change. Then, having patients and families start using the language and start asking their providers, sort of flipping the dynamic and the power structure. Eric: You just published a study showing that you scale this intervention in Hawaii, is that right? Eric: The place to scale your intervention. I have to do research in Hawaii too in the future. Don't I? At my age. Eric: Podcast on the beach. Angelo: Hawaii was amazing. It just happened to be one of those opportunities that just came around and you had nothing to do with it. The Blue Cross of Hawaii, Hawaii Medical Service Association, had read one of our ... We were covered in a magazine, I think, and they called me up three years ago, and they said, do you mind coming and giving a talk. I was like, hell yeah, I had never been to Hawaii. And I gave the talk but it was unusually because it was in the executive suite of a corporate building. It wasn't a bunch of docs. I was like, this is weird. I gave my usual talk and one of the C-suite folks said, would you be willing to make the conversation the standard of care here in the state of Hawaii, by using videos. I am like, Hawaii is pretty nice, sure. What we did is we tried to scale it so that we not only hit hospitals but we went to clinics, outpatient practices, specialty clinics. Then, we started going to churches, synagogues, elderly housing. We started going on television, radios. Over the last, let's see the paper that you read was the first 20, 18 months, where we looked at 42 thousand covered lives, and what we saw was an increase in documentation, hospital and patient by 40%. Increase by hospice discharges by, I think it was 22%. Also, and I don't think we included this particular one in that paper, a decrease in hospital deaths by 22% for late stage patients. That is incredible! 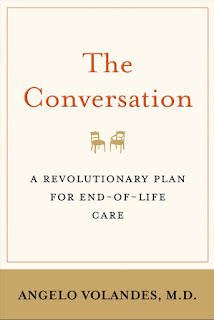 It wasn't just, let's have the conversation when you are about to get tubed in the ICU. It was also, let's bring it out to churches, out into the community, let's get the community involved. There are so many different videos. Our videos is my wife, who is African American narrator. We didn't think that would work in Hawaii necessarily so we used the chair of medicine of Hawaii, who looks a lot more Hawaiian. So we re-film a lot of the videos. We also did it in different languages, which is key, because you want to meet the end user where they are at. These weren't just Google translate, they were adopted and adapted. In Hawaii, it was Chinese, Cantonese, Mandarin, Vietnamese, Korean, Japanese. Marshallese, some of the minority languages as well. It has been a fascinating understanding because even though it is about Pal Care, it is also about QI, a lot of this was just quality improvement stuff. It has been a fascinating experience. We are still not complete in terms of the entire state, but right now anybody in the state, 1.4 million residents, have access to all of our videos and it is now the standard the care for most health care settings in Hawaii. Angelo: We created a non-profit foundation that just does this. I am more of, my responsibilities at MGH are all the research. What we did is for the masses, for everybody, we have free videos that are readily available and they are free videos that anybody, anywhere can use, but you can get started with the process. It is our five most common videos which is, ìhow do you have the conversation? What is palliative care?î because we think that there is too much misinformation about that, about pulse forms, also about, ìhow do I talk to my doctor?î Those are free and available, and they are also in different languages. People can just go to the website and use those as they wish. For places that have an infrastructure, where they have taken this on, then we ask them to license the videos through our non-profit, that is how we keep going to make more and more videos. For, I would say 99% of places, all that they need to do is use the free videos and start the process. We have them out there. They have been available for the last few years and in different languages. Alex: That is great. What is ahead, what is the next step, what is the future, where are we going here? Angelo: One of the hardest things for me is talking to an audience and getting NICU nurses, coming up to me saying why aren't you doing this in the neonatal ICU. I was like, NICU, I haven't been there since third year medical school, what would I go there for? That is where it was fascinating. Pediatrics, the variability of how this is occurring in pediatrics populations, whether it is for the extremely premature infants or pediatrician, that is where I think that this really needs to occur because there just isn't enough standardization. We are focusing now on pediatric populations, as well as care givers. Not creating videos just for patients, but for the sons and daughters who are making these decisions. For example, we were just working on a video to help say a daughter of a mom who has advanced dementia, or advanced heart failure, and they now have shortness of breath. How do I know when to take my mom to the doctor or to the emergency room versus trying to do some simple things at home that might be able to alleviate some of the symptoms? Angelo: ... I know that that's the sort of stuff that gets you going as well. Angelo: It is all done differently and I think that you have to be respectful of the local medical milieu before you say this is how you do it. Some places have the nurses during the intake on the floor -they do it. Other places have the docs show it. Other places say this is an interdisciplinary thing, it is not the pervue of just the docs, we are going to have our social workers do it. It all depends. Most of the places it is an iPad or on a tablet. Not on a TV which is twelve feet away but you know, it is very powerful when I use it with my patients. I have it on an iPad, it is a few inches from the patients face, often I will have a family member scooch in with mom on the hospital bed, and it is a powerful experience. I just sit back and observe them, I don't watch the video, I look at them. So much of the information I get is just looking, not at what they are saying, but at their body language. That is just powerful to watch. Alex: Video advanced care planning for nursing home residents with advanced dementia, actually for their surrogates. Angelo: Absolutely. It is for the surrogates. Both Laura and Susan Mitchell, the senior author, are my colleagues. Susan is actually my co-PI on two of our grants and Laura is a co-investigator on one of those grants. What I really enjoy is to see more people doing this because I think that it is important because of that issue of bias. To have other people make all different types of videos, I think different frame works, different perspectives, artistic choices, colors, literally colors of graphics, the type of people that you pick, or who is the narrator. I enjoy more and more people studying the use of video. The video is here to stay folks. We are on audio but it is going to go to video very soon. It is just our brains are rewired just like that. I invite other people to try to do this and I encourage people to just try different things. Even though we have a couple hundred videos now, in 20 different languages, I tell people to do the same things that we are doing because you will have a different take. And we have to see because it is still a very nascent field. Alex: Rebecca Sudore in our group has her own video take on things that prepare for your care. Angelo: I think that Rebecca is a pioneer in this. She was the first really, to use videos in the advanced care planning context. What I love about Prepare for Your Care is that it is values neutral but it walks you through at a wonderful way, at a means that people with a low health literacy can understand. Vulnerable populations. It is just wonderful. In fact most of my patients know about her site. In fact, I would say most of our videos include a link to Prepare for Your Care, because I think that is the way to scale something like this. Alex: That is terrific. How should we wrap this up Eric? Eric: Maybe a little bit more Johnny Cash, just to finish us up. Transcript was edited by Sean Lang-Brown . Just listened. Love the new podcasts. Fun to hear a bunch of my favorite people talk about this work. Angelo is a leader and this book is excellent!